How will the triumphant women of Congress affect US politics? 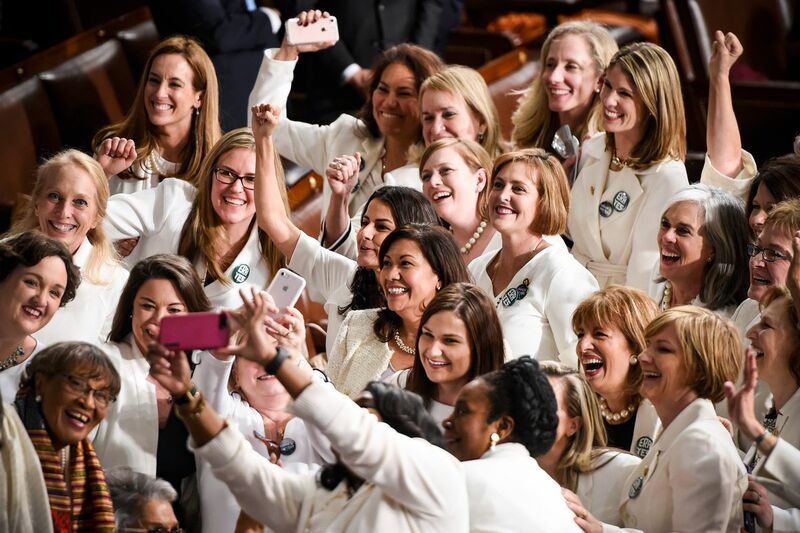 When President Donald Trump gave his annual State of the Union speech last week, he noted that the US now has “more women serving in the Congress than ever before.” In a stunning image, Democratic female lawmakers — dressed in white in honor of the suffragettes who had helped win the right for women to vote — stood, cheered and high-fived each other. Following elections in November, the new Congress that took office in January includes 127 women — a record number for the US. However, at just under 24 percent of Congress, women remain notably underrepresented compared to the general population. According to the Brookings Institution, the US only now meets the world average for women in national legislative bodies. Nonetheless, the new Congress represents a historic increase in the number of female lawmakers. This development naturally raises the question of whether, and how, having more women in leadership will affect the way Congress governs. With such a limited history of women in senior levels of government in the US, there is a lack of clear evidence to help answer those questions. However, there are some reasons and studies to suggest that a larger number of women in Congress will affect which issues it focuses on and how it functions. This is especially true since a few of the women are in positions of power, including House Speaker Nancy Pelosi, five women who chair House standing committees and one woman who chairs a standing Senate committee. The 2018 elections saw a record number of women candidates, and many of those who won openly embraced their identity as women. Multiple studies have shown that female lawmakers are more likely than their male counterparts to address issues of specific interest to women, such as family leave policies, funding for women’s health issues, and domestic violence. There is also evidence that women politicians spend more time than men on different types of broader issues, such as education and climate change. Different studies of women in national or state-level legislatures in the US suggest that women lawmakers are more likely to seek bipartisan support for legislation, to work cooperatively and to produce more legislative proposals than men. One particularly interesting change is that Congress now has a significant increase in the number of lawmakers who are mothers of children aged less than 18 years — albeit still a small minority. According to Vox, 28 members of Congress are now mothers of younger children. Some changes are being made or considered to respond to their needs, including adding baby-changing stations to a House members-only restroom, adding more nursing areas, and possibly changing voting schedules to better accommodate parents with children at home. These changes might seem superficial, but they highlight the ways in which Congress has long acted on the assumption that members did not have children at home or, if they did, had a spouse at home to care for them. Adding more working parents, especially working mothers, to Congress means that its membership better reflects the realities of the American public, as both parents work in 61 percent of married-couple families in the country. Democratic women are the driving force behind the historic increase in women legislators. More generally, a significant portion of women lawmakers are new members of Congress. While they will lack the seniority that is important to holding power, they will also bring new ideas and challenge old norms. While having more women in Congress is likely to spark some changes, none of the women came to Washington to only represent women. They were elected to represent their district or state’s constituents. They also have overlapping identities. They are members of racial, ethnic, religious, class and generational groups, and these identities also affect their views and priorities. Among the new female members of Congress are the first two Muslim American women elected to Congress, the first two Native American women in Congress, and the two youngest women ever elected to Congress. Women lawmakers’ life experiences include careers in the military, the CIA, business, law, academia and more. It is difficult to know to what extent these women will act as women, as conservatives or liberals, millennials or baby boomers, urban or rural, religious or not, and so on. To what extent will their actions reflect their identities and life experiences as women, and to what extent will they draw on their other life experiences and perceptions of their constituents’ needs? The women of Congress also come from both parties and represent multiple different political ideologies. The partisan divide is important in understanding how women will affect Congress. Democratic women are the driving force behind the historic increase in women legislators. According to FiveThirtyEight, only about 15 percent of the women in the current Congress are Republicans. This means that women will have greater influence on Democratic legislation, and that women’s impact in Congress will have a Democratic tilt. Women in the US Congress still face a major challenge in that they remain an underrepresented minority. How might women govern in a Congress in which they were closer to half of the membership? How would women affect Congress if they were more equitably divided between the political parties? Would a Congress with a membership that more closely resembled the population govern better? These are questions that will have to wait for the future.